Home » Motorsport » Porsche to return to F1 with Williams? Porsche to return to F1 with Williams? The Mexican grand prix in 1991 was the last time that a Porsche powered F1 car raced. In the hands of Michele Alboreto and Alex Caffi, the Footwork Porsche cars failed to qualify for most races and when they did make the start the cars wouldn’t last long before suffering reliability gremlins. It was an unfitting end to the German manufacturer tenure in the sport, with them having won three world championships in the 1980s with Mclaren. However, Porsche may be about to put all of this right. Formula One is still massively popular, with a global audience of about 600 million people seeing at least some F1 action every single year. It’s appeal is universal and it has made global megastars out of the likes of Lewis Hamilton, Michael Schumacher and Fernando Alonso. Nigel Mansell can still make money from his association to the sport today by appearing in Moneysupermarket car insurance adverts fifteen years after his retirement. The appeal to companies such as Porsche in terms of F1 offering a global marketing platform is therefore obvious. However, there have been two major problems with the sport in the past couple of years, the main one being costs. Toyota is alleged to have spent $3 billion over eight years in their unsuccessful attempts to win a F1 race, achieving a best constructor championship finish of 4th in the process. This is an unsustainable sum, especially following the credit crunch, and ultimately led to Toyota’s withdrawal, with Honda and BMW also withdrawing. However, the FIA and FOTA (Formula One Teams Association) have worked hard at reducing the costs of participation. This has resulted in a resource restriction agreement, which is aimed at making the sport cost less for the top teams while making it possible for the smaller teams to be competitive. Virgin has managed to complete its debut year in 2010 on a budget of just $40 million. Despite this handicap, the team has still managed to close the gap on the top teams by over a second, proving that the resource restriction is working. The agreement has therefore now been extended for an extra two years. Virgin now believe the sport has the ability to become the most cost effective marketing platform available. The second problem the sport has faced has been its relevance to the real world. Over the years, the sport has increasingly strayed from one of its major attractions, that of being a technological innovator and creating technologies which would later be used on road cars. With fuel efficiency becoming an ever bigger consideration for road users, the sport started to suffer problems. For 2010 the FIA banned in race refuelling, which many fans felt would be detrimental to the racing. However, the purpose of this was to force engine manufacturers into developing new technologies and techniques to reduce fuel consumption in order for them to benefit from having a lighter car at the start of races. The hope was that these techniques and technologies could be transferred to road cars in the coming years. KERS (Kinetic Energy Recovery Systems) are set to play a big part in this, with the devices being reintroduced for 2011. Ferrari has already used KERS technology on its 599 hybrid model, while Williams F1 have developed flywheel KERS devices for use on London buses. Each team will be striving to make the KERS devices as light as possible, and therefore will be aiming to make the lithium ion batteries as small and efficient as possible. This could have significant implications for hybrid road cars in coming year, and car manufacturers are likely to be very interested in these developments. Indeed, Porsche has already used Williams KERS technologies on one of their GT sports cars. The two major problems associated with the sport have therefore been addressed and overcome, making the sport very attractive to car manufacturers once again. Entering the sport for 2011 or 2012 would be foolish. The engines presently being used by car manufacturers already involved in the sport, have been in use since 2006 and are therefore heavily refined meaning Porsche could only underachieve. However, plans are afoot to introduce new engine regulations for 2013 with engine sizes being reduced from 2.4 litre V8’s to 1.6 litre turbos. The chairman of VW, Ferdinand Piech, said this week that the company has now plans to enter any of its car companies (including Porsche) into F1. However, this is likely just designed to force the F1 teams into agreeing to change engine regulations with many of them now advocating continuing with the present regulations. If the engine sizes do change, this would be a good opportunity for Porsche and other car manufacturers to enter the sport on a level playing field. The big remaining question is how the company should enter the sport. One possibility is to create its own team from scratch as Toyota did. However, Porsche chairman Mattias Mueller recently admitted that this is not desirable due to the time that it would take for the team to become competitive. The ideal solution is therefore to partner an existing, experienced team. 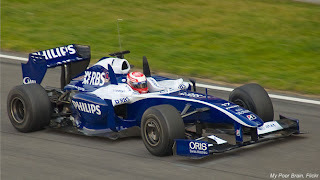 Williams F1 has been facing increasing difficulties of late, with three of its major financial backers withdrawing in time for 2011. This has forced the team to face the prospect of hiring pay driver, Pastor Maldonado who has a reputation of being a crasher despite his GP2 championship victory in 2010 (he won the title in Monza after his title rival crashed out, allowing Maldonado to celebrate with an even more spectacular high speed accident). Williams would be the best possible partner for Porsche due to their experience and skills. The team hasn’t won a race since 2004, but this is due to a lack of investment. Porsche could provide the missing piece of the puzzle by giving Williams the finances needed, resulting in what would likely be a winning force. The team is presently rumoured to be attempting to get the young German Nico Hulkenberg to commit to a five year deal with them, this would mean Hulkenberg would be present for Porsche’s arrival in 2013. This is significant because Hulkenberg would be Porsche’s ideal driver, because he is a young future champion who happens to be German. Piech’s recent comments of F1 not appealing to the company are likely just an attempt to force the F1 teams into accepting the 1.6 litre turbo regulations for 2013. It is unlikely that Porsche would want to enter the sport without these regulations due to the potential to create a level playing field. F1 would appeal to Porsche due to the newly found road relevance and cost efficiency of the sport, which would complement the huge global audience. A Williams Porsche team led by Nico Hulkenberg in 2013 doesn’t sound so far fetched.